Embark on an odyssey into the world's most exotic cuisines! Exotic Green is your source for food, Spices, Beverages, Fish, Shrimp, Seafood, Grains, Noodles, Fresh Exotic Fruits and vegetables, Meat, Snacks, Sweets, Cosmetics. 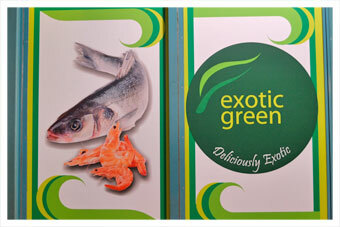 From Indian, Philippines, Thai, Korean, Malay, Chinese, and Japanese and Arab, African, and Latin American brands, Exotic Green's shelves are consistently stocked with the supplies you needs to get a taste of home or journey through the finest flavours on the globe. More than just a store, Exotic Green is a meeting place for friends, family and gourmets from diverse cultures who come for its wide selection and great service. Our staffs are always at hand to help you find what you're looking for, answer your questions or just have a friendly chat. Discover food from over 25 countries at our convenient location in Vienna's beloved Meiselmarkt shopping centre, adjacent to the Johnstraße metro station (U3 line). Visit us to taste the world!